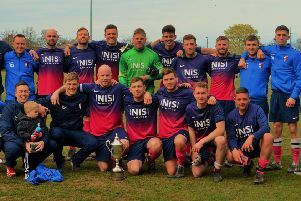 Ponteland visited second in the league Cramlington Town in the second round of the Bay Plastics George Dobbins League Cup. For once United started brightly taking the game to the hostsand with only six minutes on the clock they took the lead. Garwood played a long ball forward which fell to Ethan Bewley and the in form striker shot home. And it got better when Chris Garwood volleyed home from a corner to double Pont’s lead, before Havelock-Brown flicked the ball past the keeper for a third. Pont couldn’t believe their luck when Cook made it four with only 20 minutes gone. Five minutes later Cramlington pulled one back when Joel Arnold rose unchallenged to head a corner powerfully into the back of the net and this gave the home side some hope for the second half. Proctor pulled off a good save to deny Victor Jefferson but he could do nothing to stop Rob Eastways pile driver from substitute Kyle Caruso’s long cross only two minutes into the half. But Cook restored Pont’s three goal margin on 57 minutes when he collected Garwood’s through ball to outpace the defenders and score. Town never gave up and always looked dangerous from set plays. On 65 minutes Joel Arnold once again headed home from a corner to reduce the margin and give his side some hope. Ponteland’s answer was to continue to attack and Cook outpaced the defence and the approaching keeper before shooting into the net for his hat trick. Cramlington hit back with 15 minutes remaining when Eastway powered in a free kick past the surprised Proctor from fully 30 yardsto make it 6 - 4. This quickly became 7 - 4 when Ethan Bewley received a pass from his brother and turned his marker before firing low and true into the bottom corner to crown a fine individual performance by him.